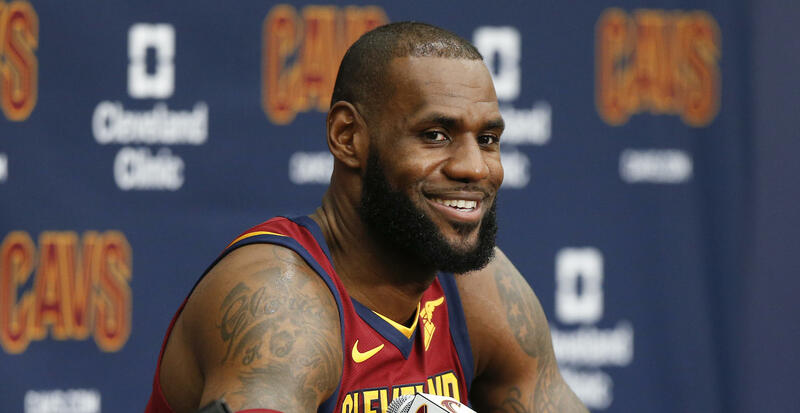 LeBron James says Trump "used the sports platform to try to divide us"
LeBron James of the Cleveland Cavaliers said Monday that President Trump is using sports as a platform to divide Americans. "The thing that kind of frustrated me and pissed me off a little bit is the fact that ... he used the sports platform to try to divide us," the NBA all-star said at a news conference. "Sport and sports is so ... amazing -- what sports can do for everyone, no matter the shape, or size, or race, or ethnicity, or religion or whatever," he said. "And it brings people together like none other." He added, "I'm not going to let -- while I have this platform -- to let one individual, no matter the power, no matter the impact that he should have or she should have, ever use sport as a platform to divide us." James called the presidency the most powerful position in the world and said Mr. Trump doesn't "understand the power that he has to lead this beautiful country." "He doesn't understand how many kids, no matter their race, look up to the President of the United States for guidance, for leadership, for words of encouragement. That's what makes me more sick than anything," James said. His comments came after President Trump criticized NFL and NBA players during a Friday rally and on Twitter over the weekend. First, Mr. Trump suggested that NFL team owners should fire players if they kneel during the national anthem. He later revoked the Golden State Warriors' invitation to the White House after point guard Stephen Curry who said he didn't want to visit while Mr. Trump is in office. James on Saturday called Mr. Trump a "bum," and said, "Going to White House was a great honor until you showed up!" On Monday morning, Mr. Trump continued to criticize the NFL tweeting: "The issue of kneeling has nothing to do with race. It is about respect for our Country, Flag and National Anthem. NFL must respect this." At the news conference, James touched on the NFL protests. More than 200 players took a knee Sunday while others raised fists or locked arms in a show of unity. "It's not about disrespect for flag and military and people who served," he said. "It's about equality and having the option and freedom to speak about things they feel are unjust." James also mentioned free agent quarterback Colin Kaepernick who started the kneeling movement in 2016. "I salute Colin Kaepernick for being as powerful as he was, and being the one that had to fall on the sword unfortunately, and I hate that... I wish I owned an NFL team right now, I'd sign him today." James ended the conference by saying that the people ultimately run the United States, rather than one individual. "We know this is the greatest country in the world. It's the land of the free, but we still have problems just like everybody else. And when we have those problems we have to figure out how to come together and be as great as we can be as a people -- because the people run this country, not one individual. And damn sure not him."